Some time ago I did a preserved lemon experiment and I thought it was about time to test the result. Since I actually only know this ingredient from the traditional chicken with green olives and preserved lemon tajine, I thought this was a good recipe to start with. It’s a delicious combination, no wonder it’s a classic. Other recipes with preserved lemons are most welcome! 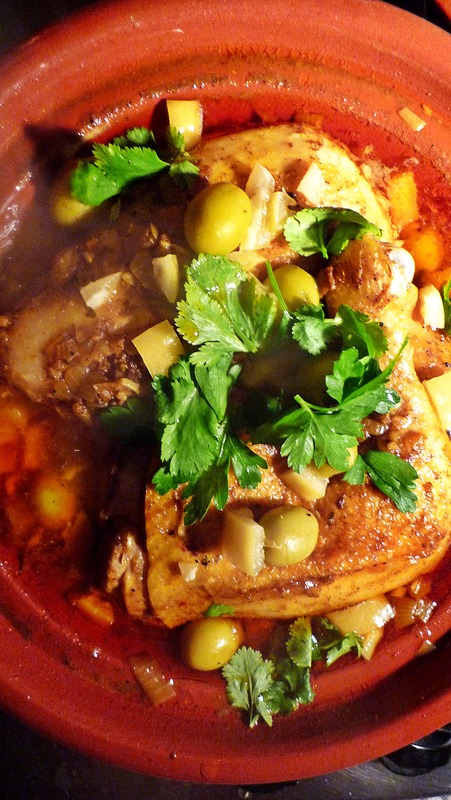 As always with tajine recipes, time is an important factor since it is a slow cooking dish. If you don’t have a tajine, you can make it in a heavy based pot with lid, or in a deep oven dish with cover. Put your tajine in water one hour before you use it. Heat it slowly on your lowest fire (preferably with a flame dispenser) and never let it on the fire without any liquid in it because than it will burst. 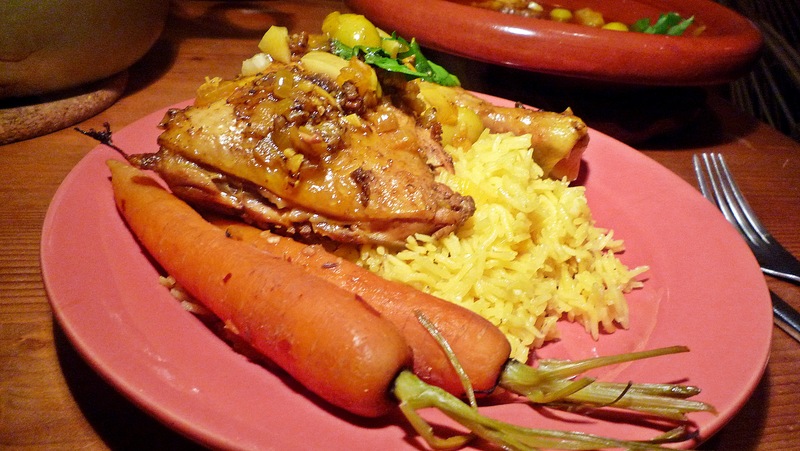 So in other words, be sweet to your tajine and it will give you some nice dishes in return. Prepare the tajine and warm a splash of olive oil in it. Cut the onion in half rings and bake them in the tajine until soft, add the garlic and bake for another minute. Bake the chicken until it has a nice and brown crispy skin. If you have a small tajine like me you might prefer to do this in a separate skillet, otherwise use your tajine. To get a crispy chicken skin, put o il in the skillet and heat it up well, bake the chicken on high fire, the inside does not have to be done; we’re just creating a tasty skin. Add the chicken to the tajine and sprinkle the spices on top. Add water almost to the edge and place the top on the base. Let it simmer on your lowest fire for at least an hour and a half but preferably longer. Ten minutes before serving, add the lemon and the olives. Serve with the fresh parsley and cilantro on top. Put the tajine in water an hour before you use it, then put it on your smallest fire with a flame dispenser and bake the onions and garlic. Marinate the beef in oil, pepper and salt two hours up front and let is stand outside of the fridge. You want the meat to be on room temperature before you bake it. Add some oil to a heavy based pan and wait until it is hot, now brown the meat and transfer to the tajine. Brown the meat in small batches because if you put to much meat in the pan at the same time, the temperature of the oil decreases and the meat is not browning but leaking all it’s nice juices. After the last batch add some red wine, balsamico and honey to the pan and stir them together, let the alcohol evaporate and poor the liquid over the meat. Now add the herbs and spices to the tajine, cover with the lid and let it simmer on a small fire. I let mine simmer on my smallest fire for about 5 hours but 2 will do as well. Add half of the fruit when you start cooking, so it gives its flavor to the dish and the other half an hour before serving so it is still recognizable. You can add the fruit whole or cut into pieces. Use some bread to scoop up the remaining of the sauce.